Trading Plans Made Simple is the essential guide for anyone who wants to achieve trading success and maximise their financial returns. Just as every business needs a robust plan for success, so too does your trading. 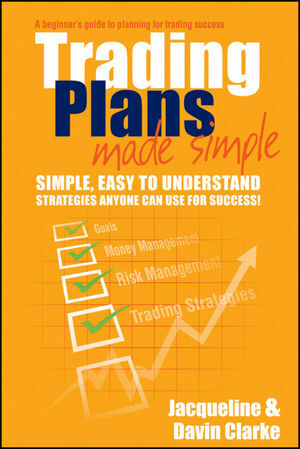 In Trading Plans Made Simple you will discover the simplest and easiest way to build a comprehensive plan for your trading--one that will help you trade like a professional and provide you with a structure and strategy to guide your trading. If you're ready to turbocharge your trading with an individual plan and maximise your success without all the stress, this is the book for you. Jacqueline Clarke is a qualified accountant and a trader of shares and derivatives. Together with Davin, Jacqueline manages their extensive trading business as their primary source of income. Davin Clarke is a well-known and highly successful private trader. He is a popular and sought-after speaker and has featured in several books, including The Wiley Trading Guide and 20 Most Common Trading Mistakes and How You Can Avoid Them.